The Ganesh I expedition leaves Kathmandu early in the morning on the 22nd of October. The air is cool, and there is hardly any traffic in the usually bustling streets. It is Dashain, time of many pujas and sacrificial ceremonies in Nepal, and our bus drives past countless houses and shops with goats tied outside or buffaloes being skinned, their blood – an offering to the ever-thirsty gods. A relatively short bumpy ride brings us to Arughat early. 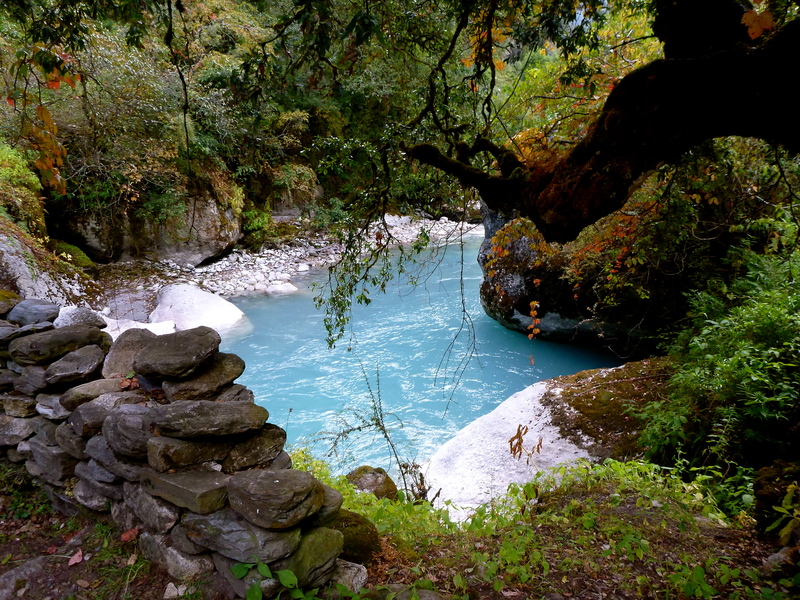 Next morning we trek to Soti Khola and Machhakhola the day after. 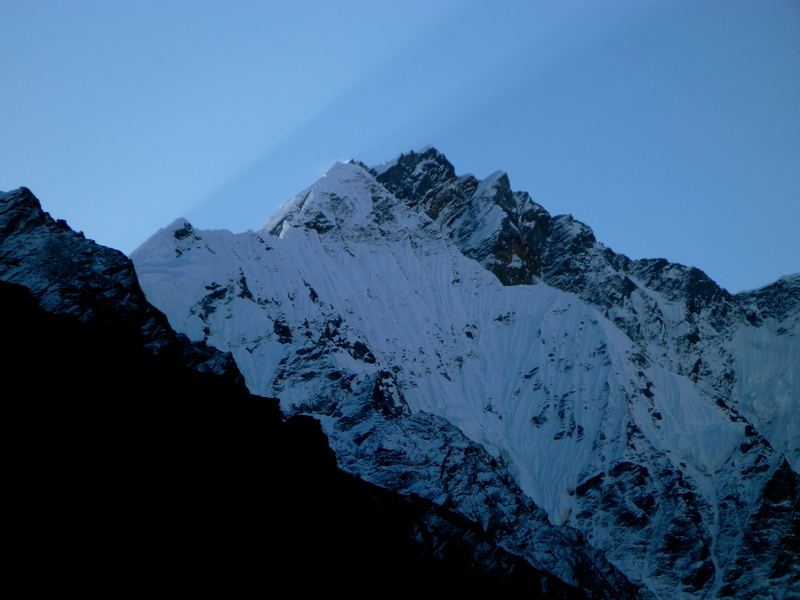 The trek is familiar to me as in its initial stages it passes through the same towns and villages as the Manaslu trek, which I have already done twice. Thus, I know that it always rains in Machhakhola. 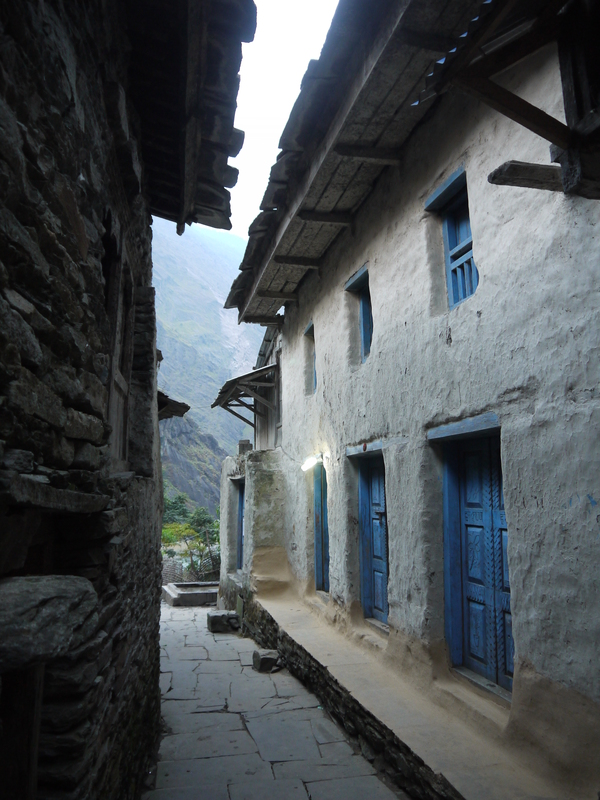 On the 25th of October, my birthday, we arrive in Jagat, which happens to be one of my favorite villages on the trail. Its location in a narrow gorge, the charming cobbled main street and the blue doors of its small houses set it apart from the other settlements in the area. I spend the evening playing with (and losing to) my new camera, snapping endless photos of the picturesque Jagat, followed across town by the curious local kids. After dinner our cook Da Pasang brings out a cake, decorated on top with what looks like my ‘portrait’ – a round smiling face with five hairs sticking out. My team mates and the Sherpas sing a cheerful Happy Birthday to me and the latter put white khatas around my neck. I am very touched by this impromptu celebration and by the gift our liaison officer hands me at the end of the evening – wrapped in shiny foil is a six-pack of Red Bull, to which I am notoriously addicted. Back in my tent at night I sit and tell myself that I am now 26. What does it mean? I reach for a little mirror somewhere at the bottom of my backpack and look at my face when it doesn’t smile like the face on the cake. I don’t regret seeing what I see: too many wrinkles for 26, sunken eyes, thin lips that curve naturally downwards… I ask myself then if I would trade my experiences, my extreme highs and lows, for youth, and beauty, and normality. The honest answer is yes, but the better answer is no. So it’s a no again, and tomorrow I will trek higher. 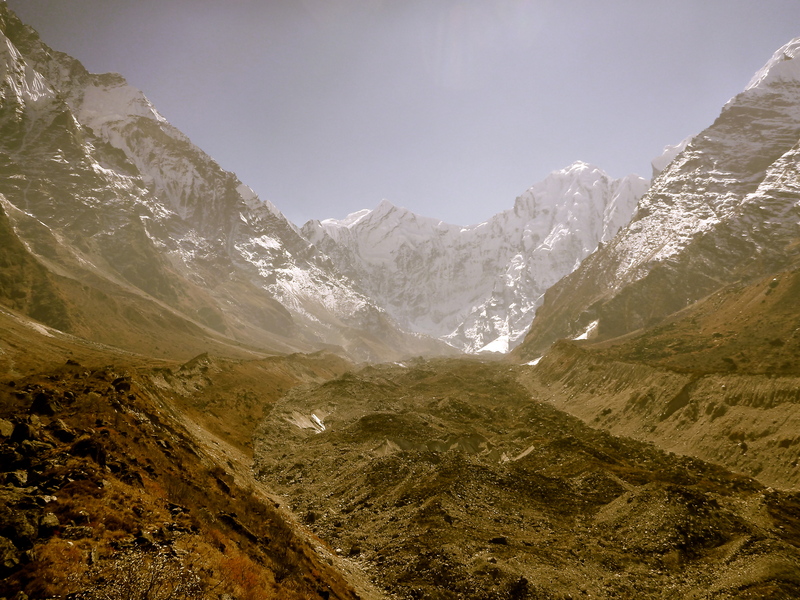 Next day we enter Tsum Valley, an area of Nepal, which has only been open for trekking for about 5 years now. We spend our first night in Tsum in a tiny village called Lopka. 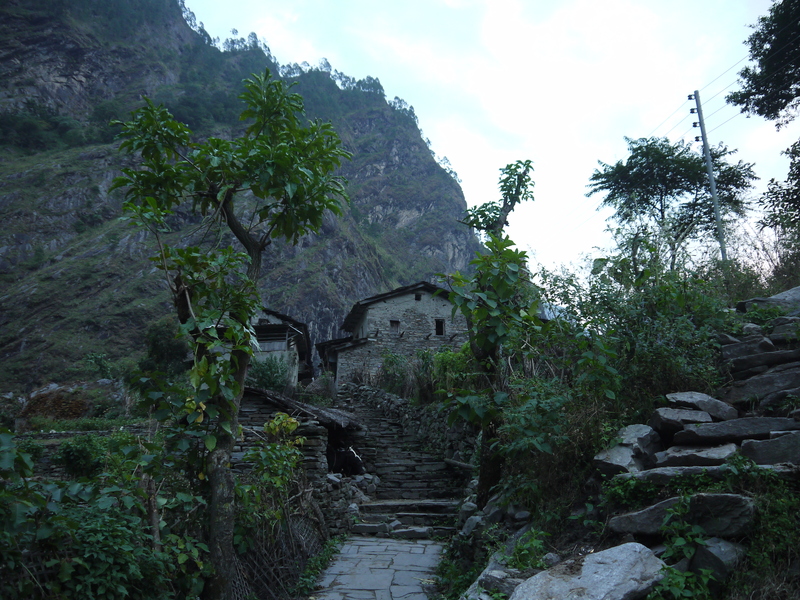 I am surprised to see that we are not the only westerners in these remote parts as there are two or three other small trekking groups or individual trekkers staying at the local tea-house. We arrive early and I wander off into the woods for a little hike. 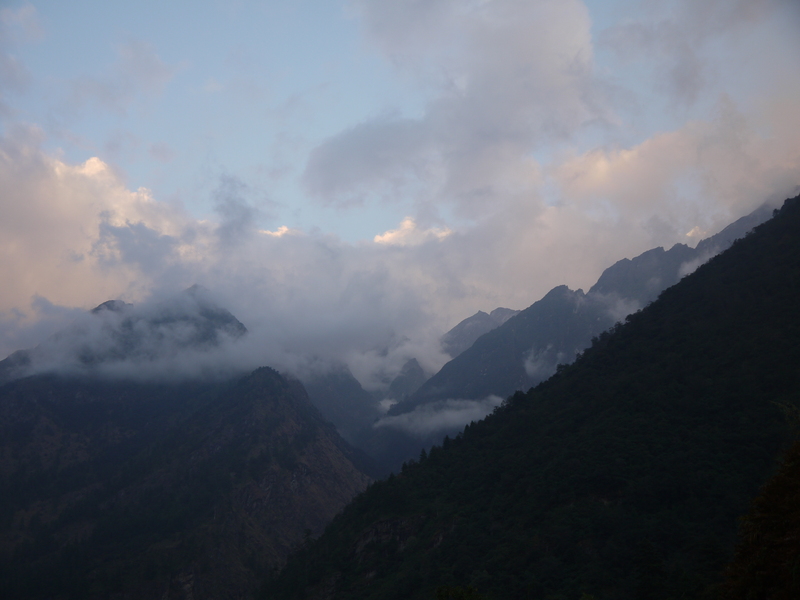 As I climb higher, I try to look past the gathering evening clouds into the valley to spot at least a glimpse of Ganesh I, the mountain we come to climb. However, the more I look around me, the more I forget what exactly it is I am looking for – Tsum Valley is fascinatingly beautiful and quietly majestic. Only when the air gets too cool for what I am wearing do I remember to check my watch, and retrace my steps back to the campsite. My facial expression probably speaks eloquently enough of the extent of my confusion because he asks me if I have a map. ‘No,’ I reply guiltily, like a schoolkid who shows up to class without having done the homework. ‘Yes, of course, more than one, even – but they’re not trekking guides and they’re ways behind, anyway.’ Now it’s my interlocutor’s turn to look puzzled. ‘I’m on a climbing expedition, you see,’ I explain. ‘Yes, sure…’ I mumble less than confidently as we part and wish each other a good day. ‘The Mountaineer’, then, has to consider her options: to keep going and very likely get lost, or to sit down and wait for my team to finish their lunch and catch up to me. The former could be either miserable or fun, while the latter would certainly be pathetic, long and boring, so I continue along the trail. Across the river I soon spot a village I believe to be Domje, but I cannot see the proverbial bridge to the other side anywhere. Then, fortunately, I meet another, much larger, trekking group with porters and guides. ‘They would know,’ I tell myself. As it turns out, they know no more than I do, so, reluctantly, I entrust myself to my navigational instincts alone and walk on. Amazingly, I easily find the bridge, cross it triumphantly, feeling like I’ve just discovered the sources of the Nile, and follow a blurry trail under the bridge just like the Canadians have told me. Then, indeed, there’s that other small bridge they mentioned. Eventually, following a tiny path upwards, I find myself in Domje. I’d arranged to meet with the rest of the crew at the Domje health post, which is what I guess the building before me to be. ‘Domje? Health post?’ I ask the two locals emerging from the house. Several more are glued to the dusty windows, staring at me and giggling. ‘Yes,’ one of them replies. ‘Ramro,’ good, I grin, looking around me for a comfortable spot to wait for the boys. As I try to read, more Domjeans emerge from their hiding places to observe me. They appear very serious and almost scared. Of me. I certainly get them. So I smile – they smile, too; I stop smiling – they begin to look concerned. It’s seriously awkward, and an eternity seems to pass before our Sherpas arrive at the health post to distract my spectators from the Mila-show. ‘Phil is looking for you everywhere,’ one of my team mates says, as he drops off his backpack and sits down to rest. ‘Well, now, because nobody has any faith in my navigational instincts (khem…), I have to run and look for Phil,’ I complain grumpily as I put my boots back on and prepare to leave. ‘You weren’t lost, then?’ he asks, sneering. ‘Were you? It took you awfully long to get here…’ I retort. Luckily, Phil, the expedition leader, arrives at the health post before I leave in search of him. The day turned out to be quite a long and tiring one, and after dinner we all quickly go to sleep in our private tents. We hope to reach base camp by next evening and need a good rest before the big ‘jump’ in distance and elevation. We start walking early, while it is still cold. After climbing some 500 meters above Domje we see Ganesh I clearly for the first time. It looks ridiculously tall. 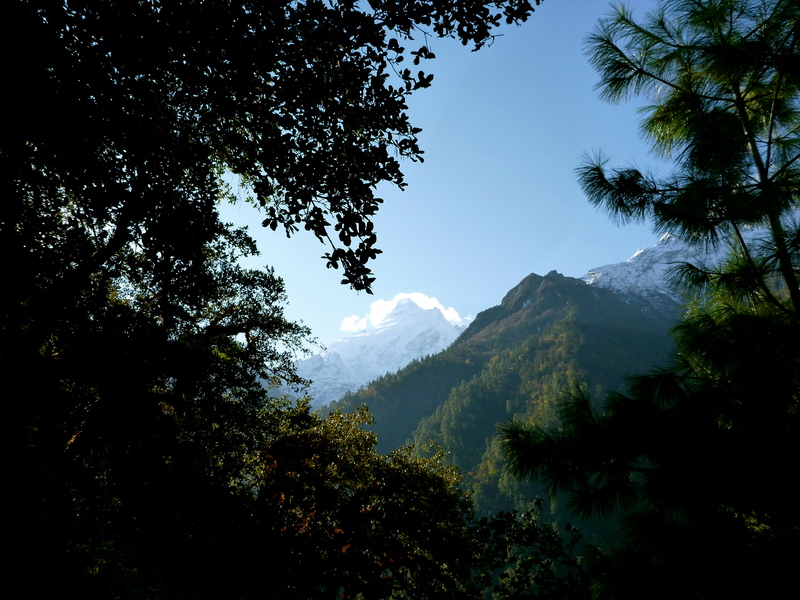 From Gumba Langdang, where we stop for lunch, the views of ‘our’ mountain, holy to the locals, are simply breathtaking. There is a small monastery with a dark prayer hall in Langdang where I go to make light offerings and pray for our safe passage on the still-unclimbed Nepal side of Ganesh I. An elderly nun is chanting prayers with me, and her quiet voice quivers a little like the flames of the 16 butter-lamps burning before the bronze Buddha statues and the old photographs of accomplished lamas. Each butter-lamp represents one of us on the expedition team: the two leaders, the five climbers, the five Sherpas and the four cooks. All I ask for as I watch the small flames is that we all return safely. It is, nevertheless, with a heavy heart that I step out of the dark prayer hall back into the afternoon sun. I know the feeling: I felt exactly the same before attempting Cholatse last February. I think, I already know what comes next as I look at Ganesh, rising majestically above the valley. Yet, our main concern now is getting to base camp. 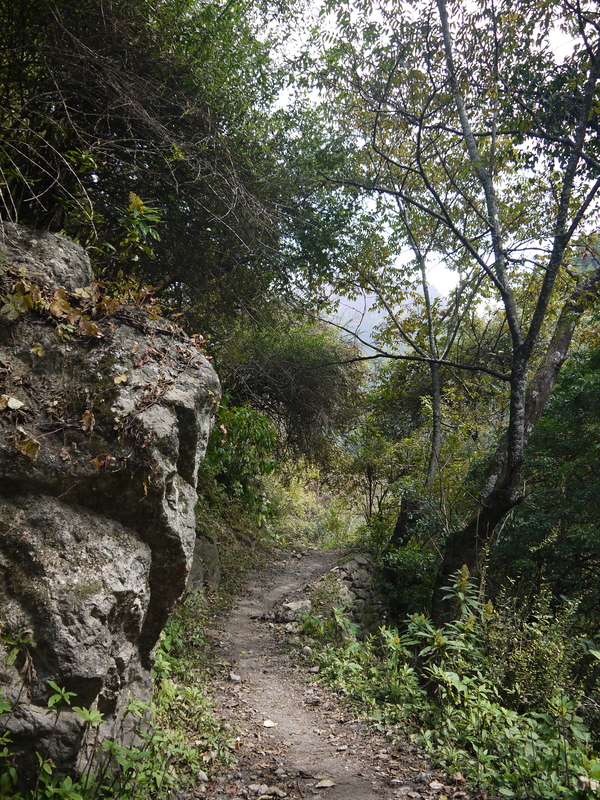 The trails leading to the foot of Yangra from Gumba Langdang are small and confusing, hard to navigate for an expedition, accompanied by numerous porters and heavily-loaded mules. The forward progress of our stubborn donkeys is not speedy enough for us to make base camp before dark. We decide to camp on a spacious clearing in the forest for the night, and leave for base camp early next day. I do love the way you write…once again you make me feel that I’m on the journey with you…bravo! Thank you! It is very flattering that you like to join me on my climbing and writing adventures :)! Beautifully written and you are quite the adventurist. Thanks for taking us with you. Nepal looks stunning, so much so, I feel I want to visit now. Thank you for reading! 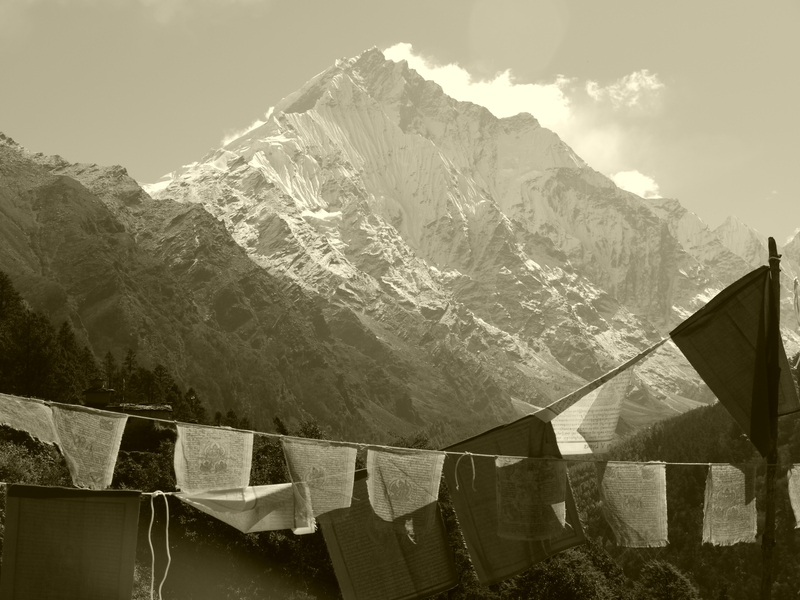 I cannot begin to describe Nepal or the Himalaya: they are something to be experienced, and then – inevitably – loved.